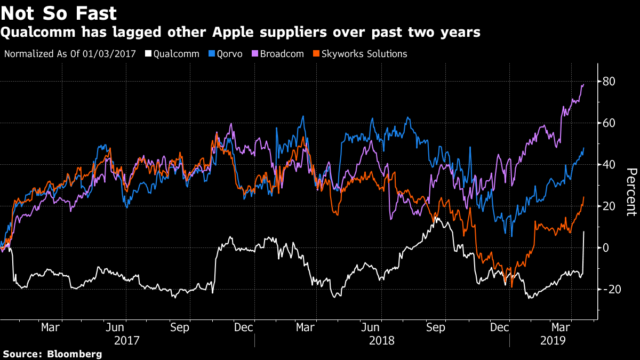 Qualcomm Inc. isn’t the only winner as its two-year legal fight with Apple Inc. comes to an end: lots of other Apple suppliers may benefit if the iPhone maker is now able to bring a 5G phone to market as early as next year. In Europe, shares of Austrian Apple supplier AMS AG jumped as much as 5.3 percent, while STMicroelectronics NV gained as much as 4.6 percent. Qualcomm rose 23 percent in U.S. trading on Tuesday afternoon after the settlement was reported and is trading up another 6 percent pre-market. “You could argue that an agreement with Qualcomm will allow Apple to introduce 5G next year and then the demand for iPhones could pick up,” H&A analyst Robin Brass said in emailed comments, adding that this could positively affect suppliers in Europe. Among U.S. Apple suppliers, Morgan Stanley analysts including James E Faucette singled out radio-frequency chipmakers Skyworks Solutions Inc., Qorvo Inc. and Broadcom Inc. as beneficiaries, estimating that the initial wave of 5G phones could add $5 of incremental radio-frequency content per phone.